By the late 1970s, a new industrial depression had started in South Wales. Although the increase in the oil process in the mid-1970s made the future of coal look secure, and showed that coal was still an important part of the nation’s energy needs, more pits began to be closed as did the factories that had brought employment to the valleys in the 1970s. This caused a rise in unemployment. People became increasingly concerned not only with the loss of jobs, but also the effect that the unemployment would have on the mining communities as a whole. This problem was not confined to South Wales however; it was nationwide problem. Margaret Thatcher was trying to diminish the power of the unions and in 1984 the National Coal Board declared it wished to close 20 pits with the loss of 20,000 jobs, claiming that the deal made after the 1974 Miners’ Strike was no longer valid. On the 12th March 1984, Arthur Scargill, President of the NUM, called a national strike against the pit closures. Many miners were involved in picketing and protesting including miners from 28 pits in the South Wales Coalfield. 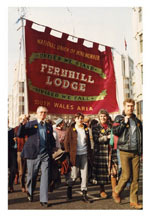 The strike was however technically illegal as Arthur Scargill had not held a ballot of NUM members. The failure to call a ballot led to the confiscation of NUM funds and enabled the police to intervene to allow a handful of strike-breakers to go into work. This led to picket line violence, particularly in South Yorkshire and Nottinghamshire. There was much support for the strike in South Wales, although a taxi driver was killed when a block of concrete was dropped on his car from a bridge, as he drove a miner to work near Merthyr. The miners wives played an enormous part in the strike. 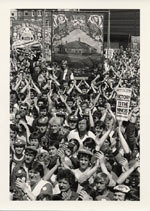 As well as appearing on the picket lines alongside the men, hundreds of women turned up at rallies and marched behind banners with slogans such as ‘Women Against Pit Closures’. They organised events to support the striking miners – from jumble sales to sponsored walks. They also organised food parcels and soup kitchens. 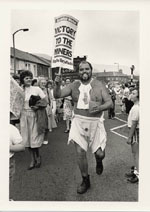 The strike lasted for nearly a year, but on the 3rd March 1985,a special NUM conference was held and the miners realised that they had to concede defeat. They returned to work two days later. In July 1985, there were only 31 pits left in South Wales. Adeney, Martin. The Miners` Strike, 1984-85: loss without limit. (Routledge and Keegan Paul, 1986). Artworker Books. Blood, sweat and tears: photographs from the Great Miners Strike 1984-1985. (London, 1985). Callinicos, A and Simons, M. The Great Strike: the miners` strike of 1984-85 and its lessons. (Socialist Worker, 1985). Fine, B and Millar, R. Policing the Miners` Strike. (Lawrence and Wishart, 1985). Miller, Jill. You can`t kill the spirit: women in a Welsh mining village. (London, 1986). New Ark Publications, 1985. The miners` strike in pictures. Wilshire, Peter, MacIntyre, D and Jones, M. Strike: Thatcher, Scargill and the miners. (Deutsch, 1985). Winterton, J. and R. Coal, Crisis and Conflict: The 1984-85 Miners` Strike in Yorkshire. (Manchester, 1989). All items listed in the further reading are available for consultation in either the South Wales Miners’ Library or the Library and Information Centre, University of Wales Swansea. Click here for a link to the library catalogue.